Grandma Lissa and Grandma Becca had turned the basement of the big old house into a sewing studio. They both enjoyed making things. Grandma Lissa was a quilter. There was always a quilt on the quilting frame and several other quilts in progress. Grandma Becca's specialty was dolls. "Becca Rose Dolls" were known by doll collectors all over the country. They had taken several awards. Each doll was completely unique and made by hand out of wool grown right on Cherry Hill Farm. Becca would begin with a huge mat of clean white wool and loosely shape it into a doll with a head, body, arms and legs. She would then squeeze and poke the wool over and over again with a barbed needle locking and condensing the fibers while she sculpted. The end result was a wool felt doll all of one piece without any seams. The skin of each doll was smooth white felt and the middle was soft like a stuffed toy. The dolls were carefully shaped about eighteen to twenty inches tall right down to the impressions of fingers and toes and they even had a nose. Becca would paint beautiful eyes and lips onto each one. She would sew clean long dark goat hair onto their heads and arrange it in pretty styles. Each doll was dressed in a ruffled dress and socks with little Mary Jane shoes. At last Becca would give a silk rose to each one to hold with a tag that said "A Becca Rose Original." Becca made about 50 dolls a year. Lissa made about twelve quilts a year so the little studio was always busy. Belle enjoyed visiting the studio when she could. She had made herself a little place up on a high shelf. She would sit in a little pincushion rocking chair and knit silk thread into shawls and sweaters using two dress pins as needles. She would rock and tap her foot humming a little tune. The studio would hum along happily. Becca had recently been invited to create a doll for a national doll show in Washington, D.C. The theme of the show was "The Magic of Childhood." Becca had been working on the doll for several weeks. The doll was beautiful. It had long golden ringlets, blue eyes and pink lips. Her dress was of shimmering light blue organza in layers and layers of lace-edged ruffles. The bodice had pearls and ribbon roses sewn into a pattern on the front. And, pearl buttons and a big ribbon bow closed the back. Becca had hand beaded little blue roses onto the shoes and had attached matching lace to the socks. She was just attaching a cluster of roses and ribbons to the doll's hair when Lil Mike came down to visit. "Oh Grandma, she's so pretty!" Lil Mike exclaimed. "Thank you Honey. All she needs is her rose." Lil Mike looked at the doll very seriously for a moment. "No Grandma." She stated matter-of-factly. "She needs WINGS!" "Yes, wings, like a fairy. She's too pretty to be just a doll." "Well I'll have to think on that." Grandma Becca stated rather taken aback. Belle from her shelf agreed. That doll did indeed need wings. Becca worked on the idea for several days. She made notes and sketches. She considered starched lace wings but they would crush so easily. Feathered wings just weren't right. Gauze and wire wings looked cheap. She even tried quilted wings but nothing worked. It looked as if the doll was headed for Washington wingless as a mouse when a little winged mouse stepped in. Late at night after everyone went to bed Belle gathered everything she needed from the supply shelves. Gismo, Lissa's fat calico cat helped her out and kept her company. First she and Gismo laid the bulletin board down and cleaned it off. She drew a pattern for the wings onto a large piece of paper then she began to push pins into the pattern creating a design. Once she was satisfied she began threading crystal beads onto silver wire and stretching and twisting the wire as she went using the pins to hold the wire in place. Belle's little fingers worked quickly. Her tail twitched as she scurried around the pins and pulled the wire. Once the wings were laid out she walked to each point where the wire touched or crossed and zapped a tiny weld to hold the wings together. Grandpa James was moving around in the kitchen when she finished the last little weld and began pulling the pins out as fast as she could. Buddy and Pal heard the activity when they got to the kitchen and came down to see what was happening. "Wow, what a mess," Pal commented. While Belle had been hard at work on the wings, Gismo had been having fun with the notes and papers that they had removed from the bulletin board. Belle looked around. "I could use a little help," she said. Belle got a needle and thread so that the amazingly beautiful crystal wings were firmly attached to the most original "Becca Rose Doll" ever made just as Becca Rose herself came down stairs to see what all the noise was. Lil Mike was right behind her. Becca noticed the bulletin board. Lil Mike noticed the Wings. "Look Grandma!" she pointed. Becca stood there staring. "How? When? Who?" Her mind just couldn't figure. "Everyone get down here." Becca commanded. "Can anyone explain this?" She pointed to the wings that Lil Mike was examining with interest. "No," came the response from everyone. They all marveled at the delicate work. There had been many mysteries at Cherry Hill Farm over the years but the Mystery of the Crystal Wings had to be the topper of them all. The beautiful doll was soon flying to Washington on the wings of a UPS plane. Her crystal wings carefully packed. A beautiful white mouse was soon flying home tired after her long night's work. 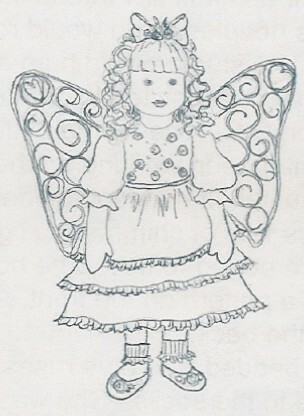 When the "Magic of Childhood" doll show opened in Washington, D.C., a beautiful doll with magical wings took first place.